The cost of the book is £20 including postage and packaging to the UK. For International deliveries contact us for postage/shipping costs. If you would like Charles Spencer to personally inscribe the book please type your (short) message where it says ' Inscription'. January, 1649. After seven years of fighting in the bloodiest war in Britain’s history, Parliament had overpowered King Charles I and now faced a problem: what to do with a defeated king, a king who refused to surrender? Parliamentarians resolved to do the unthinkable, to disregard the Divine Right of Kings and hold Charles I to account for the appalling suffering and slaughter endured by his people. A tribunal of 135 men was hastily gathered in London, and although Charles refused to acknowledge the power of his subjects to try him, the death sentence was unanimously passed. On an icy winter’s day on a scaffold outside Whitehall, in an event unique in English history, the King of England was executed. When the dead king’s son, Charles II, was restored to the throne, he set about enacting a deadly wave of retribution against all those – the lawyers, the judges, the officers on the scaffold – responsible for his father’s death. Some of the ‘regicides’ – the killers of the king – pleaded for mercy, while others stoically awaited their sentence. Many went into hiding in England, or fled to Europe or America. Those who were caught and condemned suffered agonising and degrading ends, while others saw out their days in hellish captivity. ‘This is a pacy, well-researched and beautifully written story of intrigue, betrayal and Realpolitik, but above all cold-blooded institutionalized revenge on a massive international scale. No-one will ever see ‘the Merry Monarch’ Charles II in the same way again. Little did the regicides guess when they signed Charles I’s death warrant that they were effectively also signing their own.' Andrew Roberts. 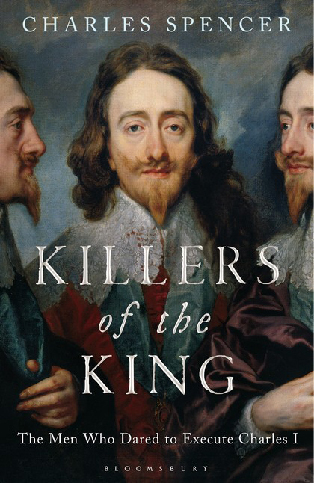 Accomplished and gruesome, this masterful account of the fate of the regicides breaks all barriers in weaving the lives - and the grim fates - of many into a seamless, pacy and riveting read, underpinned by the depth of scholarship for which Charles Spencer is renowned. An exceptional and highly original history book that sheds new light on one of England's bloodiest episodes.’ Alison Weir.‘Imagine The Odessa File re-written by Christopher Hill, and you will have some idea of the pleasure to be had in reading Killers Of The King. The virtues of a thriller and of scholarship are potently combined.’ Tom Holland. ‘Outstanding: a thrilling tale of retribution and bloody sacrifice, unflinching idealism and craven miscreancy. In fluent, measured, often witty prose, brilliantly evokes that febrile time when the hunters became the hunted and vengeance was avenged. Like all the best history books, it succeeds not only in telling a remarkable story, but also in illuminating the entire age.’ Jessie Childs. Charles Spencer was educated at Eton College and obtained his degree in Modern History at Magdalen College, Oxford. He is the author of four books, including the Sunday Times bestseller Blenheim: The Battle for Europe (shortlisted for History Book of the Year, National Book Awards) and Prince Rupert: The Last Cavalier.